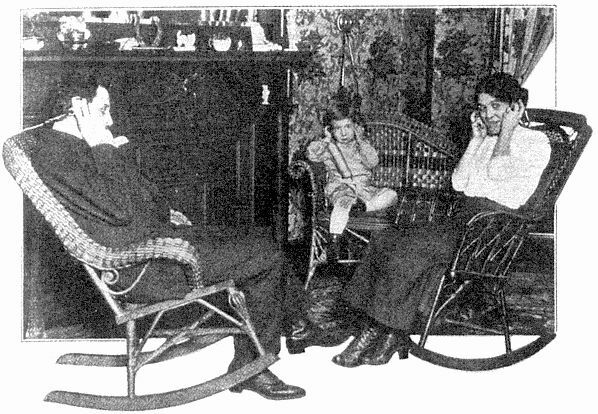 Publicity photograph of a family listening to a program from the Newark, New Jersey Telephone Herald, which appeared in the "The Telephone Newspaper--New Experiment in America" by Arthur F. Colton, in the March 30, 1912 Telephony magazine. This image is in the public domain in the United States, because it was first published in the United States prior to January 1 1923.
current 16:50, 31 March 2007 598 × 414 (80 KB) Thomas H. White (Talk | contribs) Publicity photograph of a family listening to a program from the Newark, New Jersey Telephone Herald, which appeared in the "The Telephone Newspaper--New Experiment in America" by Arthur F. Colton, in the March 30, 1912 Telephony magazine. 22:13, 30 March 2007 598 × 414 (72 KB) Thomas H. White (Talk | contribs) Publicity photograph of a family listening to a program from the Newark, New Jersey Telephone Herald, which appeared in the "The Telephone Newspaper--New Experiment in America" by Arthur F. Colton, in the March 30, 1912 Telephony magazine. 23:15, 29 March 2007 399 × 276 (34 KB) Thomas H. White (Talk | contribs) Publicity photograph of a family listening to a program from the Newark, New Jersey Telephone Herald, which appeared in the "The Telephone Newspaper--New Experiment in America" by Arthur F. Colton, in the March 30, 1912 Telephony magazine. This page was last modified 17:21, 29 May 2009.